The Pepperdine University Student Activities Office at Seaver College will host The Mountain 2018, a live worship celebration led this year by Northern Irish Christian folk rock band Rend Collective at Alumni Park in Malibu on Sunday, March 18, at 5 PM. The members of Rend Collective have never lacked imagination. From the bewildering array of children’s toys and whimsical, handmade oddities they call instruments, to the wonderfully impractical scheme of recording a live album on the beach around a campfire, to the safety-defying audacity of shooting a music video on a fully-operational fishing boat in the turbulent Irish Sea, this fascinating worship group has always pursued the colorful and unexpected. 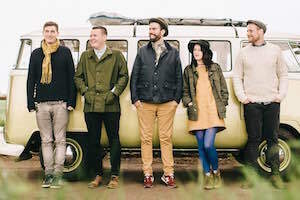 Hailing from the small coastal town of Bangor in Northern Ireland, Rend Collective developed organically, outside of the influence of the music industry. They gathered at Rend, a ministry for spiritually hungry young adults, desperately seeking an authentic, raw, and real expression of church, which was informally pastored by bandleader, Gareth Gilkeson. This honest and genuine movement of prayer and missions was accompanied by the birth of a new breed of worship songs that became the foundation for their first and critically acclaimed 2010 album, Organic Family Hymnal. Following the 2012 release of Homemade Worship by Handmade People, the band has gone from strength to strength. Their endearingly raucous live show has brought out thousands of fans to sold-out tours on both sides of the Atlantic, and they have shared stages with some of the biggest names in Christian music, such as Chris Tomlin, Matt Redman, and Tenth Avenue North. Their revival hymn, “Build Your Kingdom Here,” proved to be a mold-breaking hit on Christian radio stations, and with views numbering in the millions, the accompanying concept music video was honored with a Dove nomination. The Mountain is a student-led ministry that provides a time of worship, prayer, and community, as students, faculty, staff, alumni, local churches, and Los Angeles residents are united under the common banner of worshipping Jesus Christ. Each year during the spring semester, a well-known worship artist is invited to lead over 1,500 attendees in a night of worship at Alumni Park. Ticket prices range between $15 and $40. For additional information about this event, and to register for tickets, visit The Mountain’s page on the Ticketfly website.